No matter where a staircase is located, it becomes an important architectural component that translates style and personality. In today’s industry, there are limitless options when it comes to constructing staircases, and Better Homes & Gardens discusses some of the ideas that distinguish one staircase from the next. Akin to those seen in the 1920’s, scrollwork balusters feature extraordinary curvature that is ageless and modern. In turn, the smooth underside of a twisting stairwell is dramatic, welcoming light from different angles. When incorporated into a staircase design, glass illuminates to levels above and below, creating ambiance and transparency. Similarly, materials such as steel and travertine combine with glass to generate a contemporary feel with angular dimensions. Double staircases create a centerpiece and open concept feel, while highlighting a decorative floor or centerpiece. Advanced craftsmanship in cantilevered stairways is daring, and when constructed with contrasting balusters, become works of art in themselves. For contemporary homes or business interiors, tight spiral staircases with circular elements denote a hip, artsy vibe. Given a clean-lined glass-and-metal handrail, these stairways are a twist on standard straight lines. On the other hand, a sweeping design stretching from an entryway to an upper level provides quintessential Southern charm that is regal and formal. Finally, the materials and unique framing of a staircase, along with color schemes and décor, becomes a menagerie of art and personality. For at least as long as it takes to ascend the steps, a stairway calls to attention a captive audience. Thus, for whatever it’s worth, a staircase should feature distinctive elements that are intentional and personal to a home or business. Depending on its materials and where a stairway is positioned, it may appear dull, dated and dark. In this case, a reconstruction might tie in mirrors, light and art to bring the stairway to life. 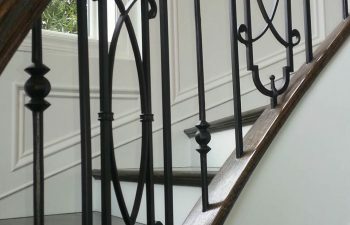 The combination of art and style are unique to each individual or business, and provide a one-of-a-kind concept for a staircase. This is incredibly appealing to visitors and guests. After all, stairs should be more than a thoroughfare. As a custom staircase company, the team of innovative experts and craftsman at Southern Staircase/Artistic Stairs incorporate a broad display of products to customize straight staircases to complex styles and designs. We work with glass, stainless steel, cable rail, wood and metal, as well as unique combinations of materials to deliver an artistic staircase that you’ll be proud to show off. To discuss your ideas or to gain inspiration for your staircase project, call Southern Staircase/Artistic Stairs today.